January « 2011 « How to make a friend in Uganda. A century ago 90 percent of Uganda was covered by natural vegetation. Today the only forests that remain are relegated to a few parks, under constant threat of encroachment from farmers, ranchers, and oil explorers. Additionally, most Ugandans still use wood as their main fuel source for cooking. You might see a problem here. 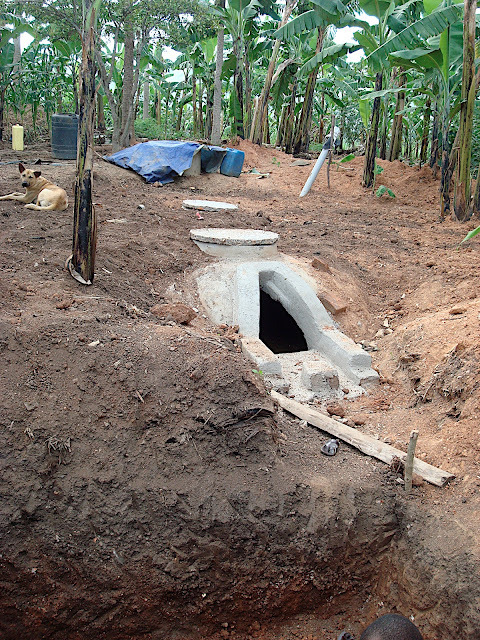 The government of Uganda has set up a program where a family can get a grant for up to half the material cost of a new biogas plant. Methane from cow or human feces is burned to cook food. Its the circle of life. My neighbor took advantage. Apparently the way this works is that the methane gas pushes liquified manure into the expansion chamber and then as gas escapes to the kitchen, manure rushes back in to maintain pressure. My friend Kyle might be able to explain this better.